A very simple and easy fly to tie, but very effective. This fly has already landed over 20 species (salt) for Hoosen. 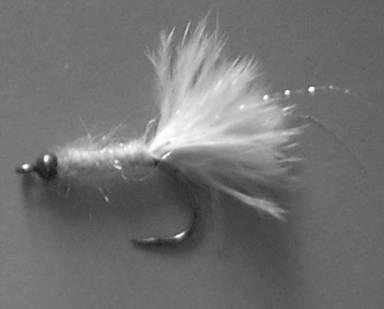 Tie in generous bunch of marabou – length of shank. Wind down shank to behind bend and back again. Tie in strand of krystal flash either side of tail. Tie in dubbing brush / chinille, wind evenly up to bead and tie off. Pick out body. Do not taper as in nymph.